The aim of this paper is to measure the business performance by taking Cloud computing adoption as a mediating variable in Indian industries. A conceptual model is framed using the concept of a TAM-TOE framework which is combined with some new constructs of ‘Risk'. Partial and full mediation are used from the umbrella concept of SEM (Structural Equation Modelling) to test the hypotheses. 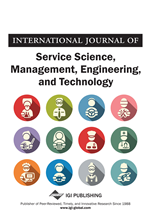 The study identified that Technological variables ‘Technology Innovation (TI)' and ‘Usage of Technology (UT)' positively mediates the relationship, Organizational variable ‘Industry Usage (IU)' negatively mediates the relationship and Environmental variables ‘Management Style (MS)' positively mediates the relationship whereas ‘Trust (T)' has no mediation effect. The ‘Risk' factors ‘Risk Analysis (RA)' positively influences the mediation process and ‘Perceived IT Security Risk (PITR)' has no mediation effect on the dependent variable ‘Business performance (BP)'. The findings of the study have some important implications. As the constructs ‘Risk (Perceived IT Security Risk)' and ‘Trust' have no mediation effect, it implies industries do not give importance on these factors while adopting Cloud computing. Hence, risk and trust resulted as the barriers for technology adoption, and organizations should verify these criteria during Cloud computing adoption of a better performance in the business. The study tests indirect effect and direct effect on business performance considering Cloud computing adoption as the mediating variable. Cloud computing is disrupting the “standard” model of information technology (IT) services in response to the increased digital solutions organisations require to remain competitive (Dhar, 2012; Romero, 2012; Linthicum, 2013; Choudhary and Vithayathil, 2013; Chang et al., 2013). This disruption, influence managers’ decision, who have to evaluate the number of advantages associated with cloud computing, such as cost savings, agility, flexibility and improved collaboration and efficiency for mobile and digital environments (Noor et al., 2013; Brender and Markov, 2013; Oliveira et al., 2014). However, the service does come with a number of potential risks regarding the security, reliability, data privacy, regulatory compliance and data protection laws among others (Yang, 2012; Brender and Markov, 2013) that have also to be taken in consideration before adopting cloud computing services. Furthermore, cloud computing represents the least transparent outsourcing model (Dutta et al., 2013) and yet there is a growing demand in organisations of all sizes in the industry sector for flexible and on-demand infrastructure, platforms and software as a service (Ambrust et al., 2010; Subashini and Kavitha, 2011; Noor et al., 2013). Consequently, decision makers have to address the advantages and risks associated with cloud services, as well as the implications of this growing technology for their specific organisation (LR7. Cloud adoption in UK, Gutierrez et al., 2015). Organizations have a significant role in contributing to a country’s Gross Domestic Product (GDP). For the benefits in terms of cost, the Cloud computing model fits much better than the classical models (Bajenaru, 2010). Training costs, fixed costs and operating costs should be controlled before any IT investment. Most of the times, the actual cost becomes higher than the estimated cost (Whittaker, 1999; Jorgensen and Molokken-Ostvold, 2006). Adopting a new technology is very cost effective for start-up Industries. Along with high cost, risk is one major factor which prevents Industries to invest in or adopt new technologies. Priyadarshinee et al. (2016) provided some new factors like security, privacy, trust and risk in the adoption of cloud computing. The study highlighted some financial parameters like return on investment (ROI) and total cost of ownership (TCO) before adopting any new technology. Most of the organizations may have a formal IT department, but they do not assure of risk of adopting a new technology. A number of theoretical models have been developed to check the usage of IT technologies in organizational level. One of them is the Theory of Reasoned Action (TRA) developed by Fishbein and Ajzen (1975). It usually explains the human behaviour towards the individual acceptance of IT (Venkatesh et al., 2003; Davis et al., 1989). Davis (1989) developed a theoretical model from the TOE framework (Technology-Organiztion-Environment) known as the Technology Acceptance Model (TAM) which further explains IT technology in more accuracy. TAM consisted of factors Perceived Ease of Use (PEOU), Perceived Usefulness (PU), Attitude towards Using (ATU) and Behavioural Intention to Use (BIU). Perceived Ease of Use (PEOU) and Perceived Usefulness (PU) are more used factors for systems checking. The first two factors are the predictors of next two factors (Mathieson et al., 2001; Legris et al., 2003; Wu and Wang, 2005). Moon and Kim (2001) criticized TAM for not providing enough information for adopting a new technology. Hence, there is a need to extend the TAM model by incorporating some new factors in the risk and trust aspect.